Deep balanced body with a stronger coffee bite softened by slight sweetness of dates and figs for regular coffee drinkers desiring a bracing cup without the complexity of additional flavours. Flavoured with a natural coffee flavour that doesn’t have any of the caffeine or acidity of coffee, Java satisfies the coffee drinker who wants a medium roast with just a bit of sweetness. Brew and serve, just like coffee! Ingredients: Organic roasted carob, organic roasted barley, chicory root, organic chicory, almonds, organic dates, natural coffee flavour, organic figs. Contains: Almonds. Surprisingly delicious... very satisfying. But my goodness... one bag was almost $6.00 more here that it was in my local, relatively small town health food store!! So do your homework and look local first! If you are looking for a coffee alternative this is what you want. I love coffee and have yet to be disappointed with teecino. Everyone I try I love. Since I could drink coffee all day this is great for me to help minimize my caffeine intake. Love it! Great product if you are looking for a drink other than tea and water when you don't drink coffee. I'd tried other coffee substitutes but I like this one the best. You make it like coffee and although I don't think it especially tastes like coffee it's a wonderful drink after a meal or even just before bed. I drink it when I want something a little bit like dessert and by adding cream to it it does hit that dessert spot especially if I eat a square of dark chocolate with it. I love all the Teecino flavours. 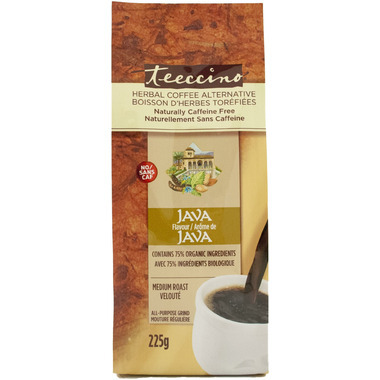 I am not able to drink real coffee because of the acid content so I have switched to Teecino. I make a "latte" and it is delicious and filling. I highly recommend it. This is a great alternative to anyone trying to cut down on caffeine. It doesn't contain the acid found in coffee that is often hard on the stomach and bladder. It can be brewed just like coffee and you don't need as much teeccino to make a cup as you do with coffee. It tastes different than coffee but has a great flavour which I now prefer over coffee. Good alternative to coffee. Since I'm breastfeeding my little one I'm trying to cut back on my caffine intake. A cup of Teeccino in the afternoon helps with my coffee craving. I'll even mix in a tiny bit of real coffee sometimes. Delicious! A light Crohn's disease guy here. I decided to stop/reduce caffein because it gave me bowel discomfort. Overall, it is a good substitute for coffee, I really appreciate to drink a tasty hot drink different than tea. Also, it doesn't give me any bowel discomfort since it is caffein free (a very important point due to my condition). However, don't expect it to taste like coffee, since it is not made with coffee. The taste is different, but good. It will take me some times to get used to it. I tried a drink with half this product and half decaffeinated coffee, it gives a more satisfactory coffee taste with a very low caffein intake. To recap, as a drink in itself it is very good, probably a 4.5-5 stars. As a substitute for coffee lover, it is good but may require a transition to get used to it, hence the 4 stars for my review. Can't say enough about this product. I like that you brew it like coffee, the colour is dark and rich, and the taste is great! It's not exactly coffee-tasting of course, but it's very close! Coffee just didn't do it for me no more! Hard on the gut and decaf was no better. Until I tried Teeccino Caffeine-Free Medium Roast Herbal Coffee!! Easy on the gut, it tastes better than coffee and it gives me that extra boost that I need to start my morning!!! You don't need to add a lot of grounds to make it taste great either! It's very affordable and versatile too!! Mix it any way you like!! This is how I mix it: I simply put 1 tea spoon full of Teeccino in the coffee machine set a 2 cups. Then I add 1 tea spoon of "Quik" to add that extra coco taste to it. While I wait for it to brew, I prepare my large cup with 1 tea spoon full of pure honey and 1 small bag of Stevia extract and about 2oz of milk then I pour the fresh hot Teeccino to the mix and stir well and then.......Voila!!!! MMMMM Goood!!!! I can't seem to get use to the taste if I drink this black or with cream and sugar but I just made a eggnog latte and it was amazing! this is such a great substitute for coffee....iced with almond milk, delicious!!! This coffee tastes, smells and feels exactly like the real thing - without all the caffeine. There's a richness to it, that adds to any dessert or makes any morning bearable. I would recommend it to anyone. The best coffee alternative I've found. It smells wonderful and tastes really good. It's not quite like coffee, but has a great flavour of its own. Make sure you don't make it too strong at first as this can put you off. 1 level teaspoon per cup of coffee is a good place to start. My husband liked it but I could hardly drink it. It certainly doesn't taste like coffee to me! I do like the fact that it doesn't have side effects but I just haven't been able to bring myself to drink it again. Disappointed. I was not expecting it to taste like coffee but I really do not like the taste. Great product! I find it a great substitute for coffee. I found the tast very distinct at first but now I can't tell the difference between Teeccino and regular coffee. And I can have it in the evening with no caffeine side-effects!! I enjoy the Javas flavor. It s a nice smooth warm drink. For coffee lovers, I have to say that the taste is not exact to coffee (you can tell the difference) but for those who can't have cafffieen this is an excellent alternative! You don't need a lot of sweetner at all so just add a touch and taste before adding more. I am not sure if I would buy this again, but I might try a different flavour. I'm so glad I've discovered this Teeccino coffee substitute! It tastes so good and is not addictive and has no side effects. A real deal! Great product, I have allergies to coffee bean and this great substitute!! !